I have been so busy lately with music and family that I have not had a chance to post my latest studies. 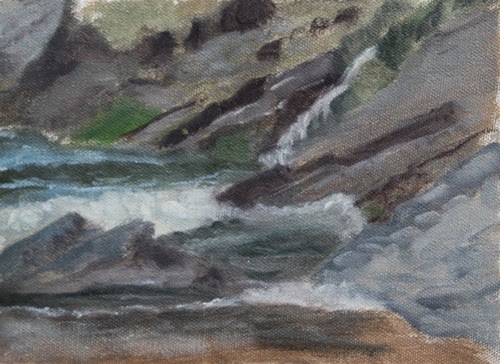 Above is Wave Study #74 painted at my usual spot at the foot of Neahkahnie Mountain. The sun has been visiting off and on here on the Oregon Coast. I have been playing with mixing different colors and trying a few different ways to handle the brush. 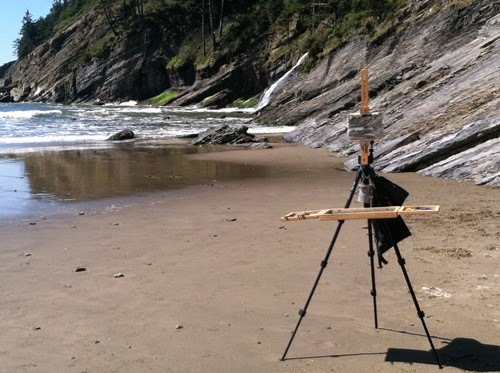 The next study is a coastal landscape study done at Short Sands Beach today. You could not ask for a more perfect day. It was a balmy-for-here 72 degrees, light winds, sunshine, and warm, warm, warm. It felt delicious! Being a Sunday and all, Shorty was pretty crowded with surfers and visitors. I rather like the surfing crowd at Short Sands. They seem to be a cheerful lot, probably because they are doing something they love. There are always a lot of dogs running around and it gives the spot a friendly festival feeling. The beauty of the area is superb as well. Here is my study from today. This one did not exactly go smoothly. I was again trying different approaches and color mixing so it was a bit of a struggle getting this one to where I was somewhat satisfied. This is very much a study so I will leave it at that. 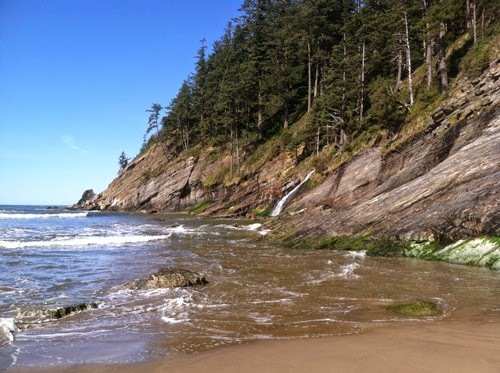 I have decided to do many studies of this waterfall at the north end of the beach. I would like to eventually do a larger studio painting of this area based on my studies. 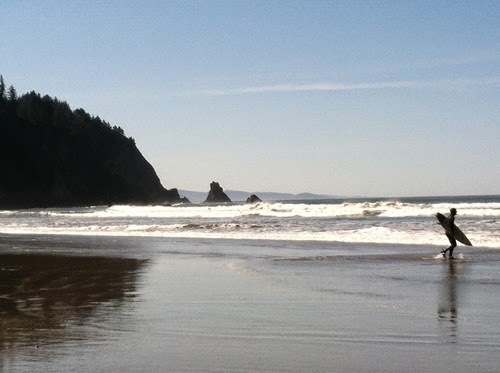 Here are a few pictures that do poor justice to the beauty of this beach. I think you all might understand why I can't resist painting here. It is a short 5 minute drive from my house. 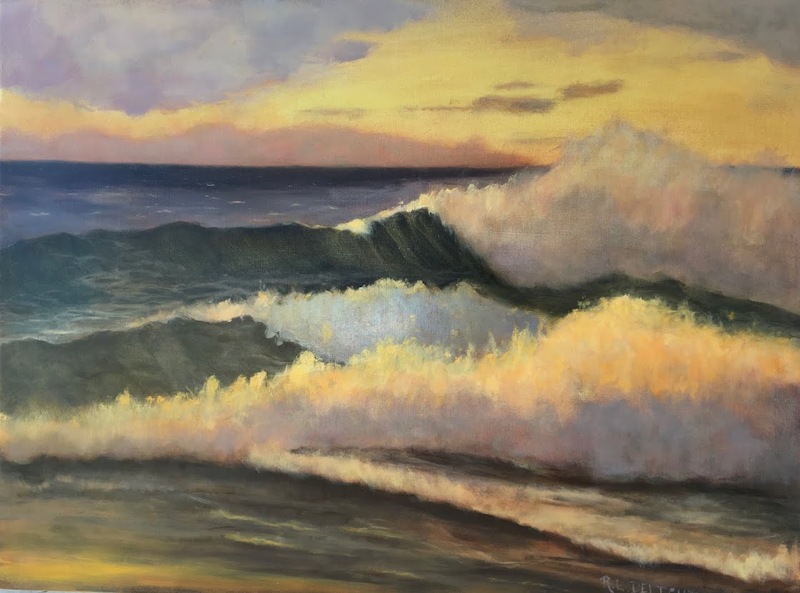 I could spend a lifetime painting within a ten mile radius of where I live. Lucky me! Short Sands Beach. 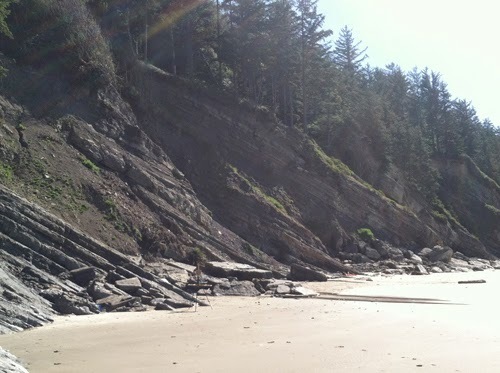 You can see my painting easel toward the left at the base of the diagonal rocks. My office. Truly a perfect day in paradise. There were many surfers today. View looking south toward my town. A final view of my office. I am working hard and will be posting more soon! Nice Renee! Love to see what you've been up to. 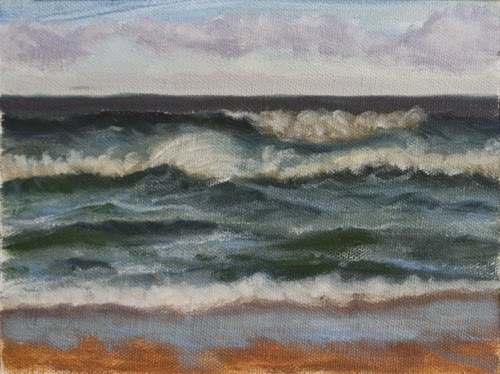 I like the wet sand in Study 74 and the waves look deep and dimensional! The second study is interesting in the color palette. I would imagine waterfalls are extremely difficult but this one is quite nice!